Top Bachata event in Singapore by Spanish Star Dani J – Live Concert Singapore hosted by internationally known MC Moe Flex! We are proud to announce Dani J, one of the most prominent names in the Bachata industry today. He has become synonymous with Bachata worldwide! Discover Asia's leading entertainment destination. Fancy adrenaline packed action at the Singapore Grand Prix and a Sensual Bachata After-Party? The stage is set! The world of party loving people will gather in Singapore for the next Singapore Grand Prix. Meet earlier for social dance with international star DJ Fabrizio Zoro and resident DJ Ashish Diwan. 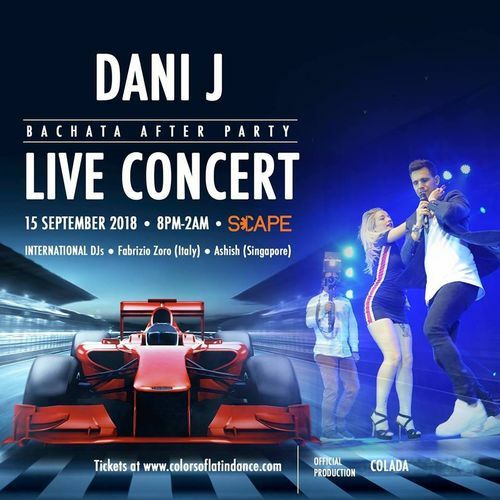 Saturday night right after the qualifying races, Spanish Bachata Star Dani J will take the stage and charm the party crowd with his world famous tunes. Live show performances by Arnold Hathazi & Wandaisha Lopez and teams of Gary Foo, Brenda Liew, Ronnie Choh and Wee Tze Yi! Support your local teams and party all night long! Dance with star Dani J on the stage and on the dance floor. Don't miss Dani J, all the way from Spain, one of the most talented Bachateros in the world! Be the lucky girl and dance with Dani J.